A’Lyric Thomas, born and raised in New Orleans, is a writer and member of 826 New Orleans’ Youth Editorial Board. On this editorial board, she (along with several other strong-minded youth individuals) publish one book per semester. The first book is a part of a project called the Good Trouble Maker’s Project, a social justice book, inspired by Representative John Lewis’s idea of creating “good trouble, necessary trouble.” In the past two years, she has been a part of: There Is No School Without Us, a literary discussion between faculty and students about the problems in New Orleans’ school systems; We Are, an anthology of poetry, short stories, photography, and more; and This Is My Happy Face: 10 New Orleans Youth have a Conversation Surrounding Mental Health scheduled for summer 2019. This semester, she is working with the editorial board to create an anthology working with youth across the United States, to give an opportunity for high school students to get their fine art, poetry, short stories, etc. published. For as long as she can remember, she has been writing. A’Lyric writes short stories and poetry to advocate for youth who cannot advocate for themselves or are systematically oppressed. She believes that writing and art can serve as a platform for victims of injustice and for youth wanting to use their voice to advocate for others. She has attended social justice events and has spoken on a variety of panels, like the 2018 Music & Words Festival & at events like the Mayor’s Inaugural Office of Youth and Families Fest. 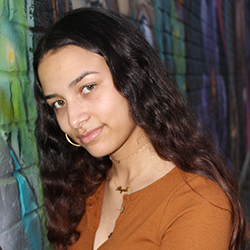 Inspiration from youth poetry organizations like NOYOM, mentorship opportunities with nationally recognized artists, and passionate peers have shaped her experience as a young poet. A’Lyric uses these mentorship skills with Echo, a community of teen poets she co-organized that provides young artists with the opportunity to workshop, collaborate and perform in New Orleans.